The cost of leasing commercial space is soaring in many U.S. cities, threatening the future of independent businesses. In cities as diverse as Oakland and Nashville, Milwaukee and Portland, Maine, retail rents have been rising rapidly. As the cost of space rises, local businesses are being forced out and replaced by national chains that can negotiate better rents or afford to subsidize a high-visibility location. The trend isn’t limited to retailers. The price of industrial space is rising rapidly too, jeopardizing a budding renaissance in urban manufacturing. The sharp increase in rents also isn’t limited to affluent neighborhoods. It’s happening across a range of communities, with some of the most intense pressure falling on businesses in lower income neighborhoods. The problem is especially detrimental to people looking to start new businesses, further raising barriers to entrepreneurship and stunting economic dynamism. A complex web of causes lies behind the issue. These include a speculative run-up in urban commercial real estate prices, growing demand from national chains seeking city locations, a limited and declining supply of the small spaces most suitable to local businesses, and a preference for national companies over independent businesses in commercial real estate financing. Although not suitable for every small business, owning rather than leasing is one of the best ways to ensure stable occupancy costs. Only a small minority of independent retailers currently own their space. Several cities are looking into programs to increase that share by helping businesses buy their buildings, or buy their spaces as commercial condominiums. In Salt Lake City, for instance, the city is exploring how to use its existing Economic Development Loan Fund and a network of partner banks to create a Buy Your Building plan for local businesses. Another approach involves expanding community ownership of commercial buildings. Through various structures, such as real estate investment cooperatives, neighbors can invest in commercial buildings and guarantee local businesses long-term stability and reasonable, cost-driven rent increases. Another set of policy ideas aims to reduce the power imbalance in landlord-tenant negotiations, and expand basic rights and protections for commercial tenants. These ideas span property tax incentives for capping rent increases, fines for landlords who keep commercial space vacant, and regulation of lease renewal. One proposal in New York City for instance, the Small Business Jobs Survival Act, would give commercial tenants and property owners a timeline for lease negotiations, a long-term lease, and recourse to binding arbitration. Zoning can be a powerful tool for creating a built environment that provides plenty of opportunity for local entrepreneurs. Key strategies include protecting the varied fabric of established commercial districts, ensuring an ample supply of small spaces, and adopting formula retail restrictions that encourage a mix of different types of businesses. Several cities have required that a portion of the space in select new development projects be set aside for locally owned businesses. These requirements could be codified and applied across all development projects that meet certain size or location thresholds. Cities often own and invest in real estate themselves. 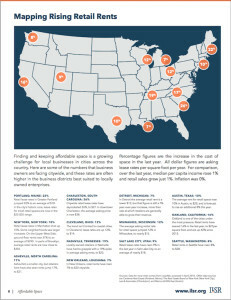 Some are establishing a preference for leasing spaces in city-owned or -financed buildings to locally owned businesses. In Seattle, for instance, the city recently renovated its King Street Station, and is reviewing how to structure its leases to give local businesses favorable terms in the spaces inside the station and along the outdoor plaza, such as flexible lengths, options to extend, assistance with space improvements or build-outs, and gradual rent increases. Down the road, provisions for affordable ground-floor commercial space for locally owned businesses could also be built into the agreements of developments that cities help finance. In underserved communities, this could include offering space at below-market rates to local, neighborhood-serving businesses. Following in the footsteps of Rome, Paris, and London, San Francisco has established a program to recognize and support longstanding, culturally significant businesses. The program, which is called the Legacy Business Historic Preservation Fund, provides incentives to landlords who agree to 10-year leases, and it could also evolve to help businesses purchase their spaces. 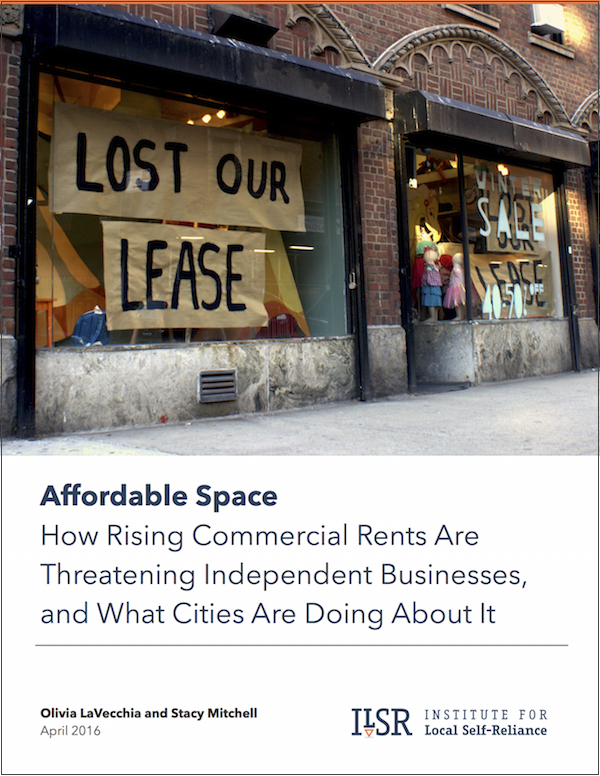 For more information about the scope of the problem and the six strategies to solve it see our April 2016 report, Affordable Space: How Rising Commercial Rents Are Threatening Independent Businesses, and What Cities Are Doing About It. The report includes on-the-ground examples, including more on Salt Lake City’s investigation into creating a “Buy Your Building” program to help local businesses purchase their property, New York City’s use of zoning to create smaller storefronts, San Francisco’s ordinance encouraging commercial diversity, and Seattle’s plans to lease city-owned property to local businesses with favorable terms.